If you like playing simple fun and addictive shooting games on your android phone, then you should easily discover that there are many games of this type that offer you that kind of gameplay. But, when it comes to finding a quality game with shooting gameplay that will keep your attention every time you play, is very confusing choosing the right one. In order to help you, we searched and we have a shooting game for you. Let’s see what the game offers you. This is one fun to play and addictive casual shooting game that is developed on android platform, offering players an interesting and challenging shooting gameplay. This game is very easy for playing, suitable for every age. Offering its players to enjoy the high-quality colorful graphics with entertaining sound effects every time they shoot and play, this game is keeping the player’s attention each time. The players on the game need to save the mushroom, keeping it alive and safe from the flood by shooting the falling rain drops. With the game the players can test their shooting skills and have fun playing. 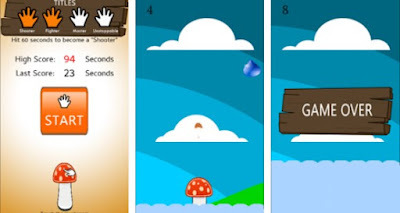 Mushroom Shoot is casual game for android, especially created to offer players to have fun shooting and challenge their skills by playing. With this game, the players will constantly be interested in playing, wanting to shoot and play more and more. The gameplay is simple and easy but highly addictive. The task of the player is very easy, he needs to shoot each rain drop that falls and wants to hit the mushroom, to prevent the mushroom of getting flooded. The player needs to touch the mushroom on the screen to move it up and down, while shooting from her tiny mushrooms for destroying the rain drops falling down. When the flood is covering the whole mushroom the game is over and the player needs to start again. Players need to keep the mushroom safe from the flood as long as they can. As many seconds as the mushroom is alive, more titles for achievements are the players getting. Download this game now on Google Play for free.